Recently I have been spending a good bit of my free time reconnecting myself to the world of music. I played the flute when I was a child and teenager - and then I just stopped. Now I am playing the flute again, and I am teaching myself the penny whistle. Over the last few weeks I have been reminded of the fact that music can truly offer solace and give your heart a lift. The books that I have reviewed below are not only perfect titles for black history month, but they also look at the way in which songs can tell the story of a people. The will help readers to see and appreciate that music truly does have the power to give people strength and hope during hard times. During the Civil Rights movement marchers, protestors, and activists had to face all kinds of obstacles. They were ridiculed, arrested, imprisoned, beaten, and bombed. It was a hard time and often, to lift their spirits and to give them strength, the activists raised their voices in song. Sometimes the words they sang described what they were doing: sitting on a bus, sitting in a jail cell, or participating in a sit in. Sometimes their songs were about “letting the best in themselves shine the brightest.” The song “This little light of mine,” was just such a song. In this powerful and memorable book, Vanessa Newton takes the words of “This little light of mine,” a gospel children’s song, weaving her own words around the lyrics to show her readers how people from all walks of life “let their lights shine” for the civil rights cause. She shows how the Jim Crow laws kept white and black separate, and she shows how people dared to fight those laws without resorting to violence. Throughout the book, Vanessa Newton marries the text with her delightfully warm and rich vintage style multimedia art. The pictures capture special moments in the civil rights movement, including the day when Rosa Parks refused to move from her bus seat, and the day when Ruby Bridges dared to walk alone to attend an all-white elementary school in the South. Many of us think that the American Civil Rights movement began in the 50’s and 60’s. In actual fact, it began many years before when slaves found ways to fight back against their oppressors. They learn to read and write in secret, they ran away to northern states and into Canada, they refused to give up their hopes and dreams, and they sang songs. The songs they sang gave the slaves the strength to go on, they gave them hope, and they gave them the means to ‘talk’ about their dreams for the future. Many years after these melodies were first sung in cotton fields and on plantations, these same songs, and other like them, were sung in churches where African Americans came together to talk about how they would fight against segregation. Songs filled the air as people marched to protest segregated buses, schools, bus stations, restaurants, and other public places. Sometimes old traditional spirituals were given new lyrics to suit the times. This carefully researched book will help readers to see the role that music has had in the struggle for civil rights in American. Among other things, the author looks at the origins of the songs that were sung, the history of the movement, and she also tells the story of the Chicago Children’s Choir. Diary of a Wimpy Kid Sweepstakes! from Twentieth Century Fox, in theaters Friday, March 19. ENTER HERE FOR A CHANCE TO WIN A PRIVATE SCREENING FOR YOUR ENTIRE SCHOOL! One grand prize for schools. Sweepstakes closes March 10, 2010, so enter today! A complete set of Diary of a Wimpy Kid books, including the new The Wimpy Kid Movie Diary, Jeff Kinney's original book about how the movie was made, and a cardboard Wimpy Kid standee. Copyright © 2010 Twentieth Century Fox Film Corporation. All Rights Reserved. DIARY OF A WIMPY KID is trademark of Wimpy Kid, Inc.
© 2009 Wimpy Kid, Inc. All Rights Reserved. Paula was born in New York and she has never experienced the Jim Crow laws that her southern parents grew up with. She has not seen the ugliness of racism, and she has not been made to feel like a lesser person because of her skin color. Now her parents have decided that they need to lend their support to the civil rights movement in the south; it is time to go home. When they get to Atlanta, Paula’s father, Andrew Young, joins the battle for civil rights beside Martin Luther King Jr. To Paula he is “Uncle Martin,” and he is the kind man who plays with her in the pool and who comes to dinner. At these dinners, Paula listens to what Uncle Martin says and to the opinions of Ralph Abernathy, Randolph Blackwell, and the other men and women who are leading the effort to get justice and freedom for African Americans. Together, over the baked chicken and the creamy macaroni and cheese, this “family” decides how they should proceed with their campaigns. Marches, sit-ins, and boycotts are all planned around the dinner table. The underlying theme is that there is to be no violence. Even if they are beaten and imprisoned, the African Americans should not respond with aggression. This first hand account as described by Paula Young Shelton, Andrew Young’s daughter, is not only incredibly moving, but it is also very informative. Readers will get a very real sense of what it was like to be an African American child who was living in the middle of the civil rights movement. They will meet some of the key players in the movement, and will come to understand how much southern African Americans suffered under the boot of the Jim Crow laws. Raul Colon’s distinctively evocative illustrations perfectly compliment the text. On this day in 1685 George Frederic Handel was born. I can still remember going to a concert of his Music for the Royal Fireworks when I was quite young. The performance was outdoors, and the music was accompanied by a real fireworks display, which was coordinated to compliment the music. It was wonderful. While I was driving around in my car today my local public radio station was playing Handel's Fireworks in honor of his birthday, and I was reminded of that concert and how much I have enjoyed Handel's music over the years. 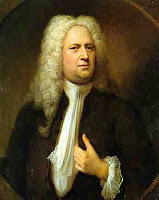 I have reviewed two books about Handel that you can view on the Handel feature page. I hope you enjoy the reviews. Here is a video Handel's Music for the Royal Fireworks - with fireworks! On February 3rd Google launched their third annual ”Doodle 4 Google” contest, a competition open to all K-12 students in the U.S. to create their own Google “doodle”. Applicants will design a doodle based around the theme “If I could do anything I would…”. The winning doodler will have his or her artwork viewed by millions on the Google homepage, win a college scholarship, earn computers for his or her school, and have his or her winning design exhibited in the Smithsonian’s, Cooper-Hewitt National Design Museum. Dr. Seuss Enterprises President Susan Brandt joins an esteemed panel of expert jurors to pick finalists for the 3rd annual “Doodle 4 Google” contest. The panel includes leaders in the animation, illustration and cartoon industries. “Dr. Seuss created a legacy of work inspiring children to dream and use their imagination to accomplish real life goals. I am honored to join this panel of experts in choosing the finalists for this wonderful contest.” Susan Brandt, President of Dr. Seuss Enterprises, L.P.
Teachers must have their students registered by midnight PDT March 17, 2010. Parents and students should direct their teacher to this website to register: www.google.com/doodle4google. Doodle submissions must be received by March 31, 2010. In honor of Black History Month I have reviewed this excellent award winning title about a little slave girl, her doll, and the Underground Railroad. At first Lindy is not sure why Freedom is such a good thing, but after she is cruelly whipped by the overseer for wanting to know how to spell her name, Lindy comes to understand that Freedom truly is something worth risking everything to get. One night Lindy is woken up when it is still dark and she, Sally, and Lindy’s mama, leave the plantation forever. They are off to find Freedom in the North. In this singular picture book, children will get to see what it was like to be a runaway slave through the sewn on eyes of a little rag doll. They will see what it was like to travel along the Underground Railroad, and come to appreciate the dangers the slaves faced. At the back of the book, the author provides her readers with more information about the Underground Railroad, and she also explains where the inspiration for her story came from. This title was one of the 2004 Coretta Scott King Illustrator Honor books. Last Friday the Winter Olympics started, and my family and I have already spent some wonderful hours watching people doing the ski jump, speed skating around and around, and bumping down moguls. We have also witnessed some bone shaking falls. I discovered this morning that I had a book on my shelf that would suit the mood of these Olympic days, so I decided to review it for you. It is wintertime and it is cold outside. A group of friends put on their warm clothes and go outside to “play!” Wearing their hats, gloves, mittens, jackets, and earmuffs, they venture out into the snow and onto the ice to enjoy a variety of winter sports. On the ice the friends figure skate, they play hockey, and they race around a track, speed skating. On the snow they downhill ski, snowboard, and fly through the air as they shoot down and off a ski jump. 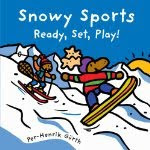 Children will greatly enjoy learning about the winter sports described in this simple and charming picture book. Animals characters drawn in bright and cheerful colors fill the pages, and on every spread children are introduced to the names of some of the items seen in the winter scenes. I am hopefully that I will be swishing down the slopes at Mount Shasta in California this Friday. Hopefully there will be enough snow. It has been uncommonly warm here this winter. Here we are wearing long sleeve t-shirts in Oregon while people in Tennessee are up to their ankles in snow! In just a few days it will be Valentine's day. Here in Ashland, Oregon, the school children are having class parties to exchange cards and gifts; shop windows are decorates with pink and red hearts and acres of tulle; and the food shops are full of people looking for boxes of chocolates and other sweet treats. Just the other day I received a delightful little picture book that I think is perfect for Valentine's Day. The story is about a mole who is looking for love, and the misadventures he has. One morning Morris the mole pokes his nose out of his hole and he discovers that spring has arrived. For Morris spring is a time for love, so he trots off to “find someone to love.” Morris has very bad eyesight, but he is sure that he will find the right animal to love because he knows exactly what to look for. Unfortunately, though he knows that he needs to find someone with “luscious shiny black fur,” a “pretty pink nose,” and “gorgeous big wide feet,” Morris does not have much luck finding the right someone. If you'd like to purchase this book for your child or your special someone click here. You can find more Valentine's Day books here. On this day in 1809 Charles Darwin, a man whose ideas would cause a great deal of fuss around the world, was born. In honor of Darwin's birthday I reviewed a new book about him. When Charles Darwin was a boy, he had very little interest in learning Latin and Ancient Greek. 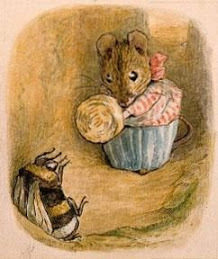 He much preferred rambling around the countryside observing nature and collecting beetles. Nothing he chose to do pleased his father, who thought that Charles could well become a “disgrace” to the family. Charles did not know what he wanted to do with himself when he grew up, so he agreed to go to Edinburgh with his brother Erasmus when Erasmus when to the university there to study medicine. Becoming a doctor sounded like a good idea until Charles realized that he found the whole thing enormously distasteful. He then agreed to go to Cambridge University to prepare himself for a career in the clergy. The plan was that he would have one last hurrah before settling down; he would go on a trip somewhere to see the world a little. One of Charles’ friends heard about a ship that was taking a trip around the world. He suggested that Charles join the expedition, which Charles eagerly agreed to do. The journey on the HMS Beagle not only changed the direction that Charles’ life took, but it also made him one of the most famous people in the world. This excellent biography shows readers that greatness can lie in the hearts and minds of even the most unlikely of people. The author helps her readers to see how Charles Darwin’s ideas developed over time, and how he came to develop a theory that that would, for years to come, cause a great deal of controversy. You can purchase this book here, and look at other reviews that I have written about Charles Darwin books here. February is Black History Month, and in honor of this event I am going to share a few special reviews with you during the month. Today I have a review of a very special picture book, a book which delighted me when I read it not long ago. 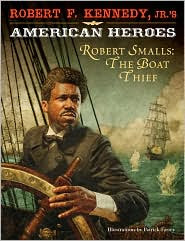 Robert Smalls was a slave in South Carolina. He worked hard to learn useful skills, and by the time he was in his early twenties Robert was a skilled sailor and navigator, despite the fact that he was illiterate. He knew the waters along the southern coastline intimately and was highly valued by the people he worked for. Planter was being used by the Confederacy to patrol Charleston Harbor, to lay mines, and to transport troops. More than anything Robert wanted to be free. He wanted to be sure that his baby son could not be sold like a piece of merchandize. Carefully Robert put together a plan, and on one night in May Robert and several other slaves stole the Planter and took her to the Union navy. Finally Robert was free, and he chose to serve the Union cause. His courageous theft of the Planter was just the beginning of what would be an extraordinary career. In this fascinating American Heroes title, Robert F. Kennedy Jr. gives his readers a description of the life of one of America’s great heroes. Readers who have never heard of Smalls will be amazed that one man was able to do so much, and that one man did so much for his country despite numerous obstacles that lay in his path. Beautifully complimented by Patrick Fariey’s stunning artwork, this is an exceptional picture book biography. A few weeks ago I posted a review of a new and very exciting graphic novel called Calamity Jack. This title is a follow on to the Hales' first graphic novel, Rapunzel's Revenge. The two authors and the illustrator very graciously agreed to do an interview about their new book. Marya: Did you know that you would be writing a story about Calamity Jack when you wrote Rapunzel’s Revenge? SH: Hi Marya! When we pitched RR, we only had a partial script, and Bloomsbury offered us a 2-book deal. At that point, we had to decide, sequel or something entirely new? As we wrote RR, we realized Jack was our guy. Though it’s not told in RR, we created it during that process. DH: Yeah, I think we knew pretty early the second book would be about Jack, but the story itself took a while to actually come together. Marya: The adventures in this story combine fantasy, fairytale, and technology. How did you come around to creating such a delightfully bizarre world? SH: We took things we love and stuffed them all together: fairy tale characters and creatures, steampunk, comic books, capers, action, comedy, romance! Why not? We didn’t want to skimp. DH: The trick was to not make the story *about* all those cool things. The best thing to carry a story is a character, I think, and once we figure that out, sprinkle in the cool. I did lobby for the bandersnatch to be the main character, but Shannon didn’t think people could relate to it. I had no problems relating, but that’s just me. SH: The only person I know who could relate to a mute creature with mouths for eyes. Marya: Jack’s efforts to gain honor, respect, and love seems to lie at the heart of the story. Was this always your intention or did Jack claim this for himself as you were writing? SH: Jack claimed this himself. While we knew the basics of his story, we didn’t know why. We wrote two completely different stories for Jack before the final, but they fell flat. It was such a relief when his underlying story finally revealed itself. DH: I think that was all a part of finding his character, finding what it was about him that made him interesting and human. Once that was finally taken care of, I felt a lot more comfortable with the giant ants. Marya: How do you work together, and do you find it difficult or easy to do? SH: Both! It’s more time consuming and can be frustrating. But I loved going on walks with Dean and discussing plot, hammering out ideas, seeing what nuggets of scenes he wrote each day. DH: This is totally true, though I think Shannon had the harder job. She had to write *and* poke me with a stick, while all I did was figure out new ways to be lazy. And occasionally write. Marya: Did you discuss the story with Shannon and Dean before you began to create drawings for this story? Dean: Yeah, we talked a lot about the story. I, for example, really wanted the character Brute, from Rapunzel’s Revenge, to join the team, so for a while he was part of the Rapunzel gang. But he didn’t quite work out. We kicked a lot of ideas around. Marya: Did the three of you decide what the characters and the world would look like, or was that something that you did on your own? Dean: Can you tell us a little about your work process? How many sketches and drawings do you create before you have a completed piece of work? I did the whole book in pencil sketch form. Sent it in to the publisher, then inked all the pencil drawings, then colored them digitally. The coloring was the hardest. It took forever. I actually had to hire a handful of color mappers to help me get the coloring done on time. Thank you so much all three of you. Every week I take my daughter to the local YMCA for her gymnastics lessons - twice. I take my computer along and get many of my reviews written while I wait for my daughter to do her tumbles, her beam walking, and her bar work. Last week, both times, a group of children were selling popcorn in the YMCA lobby to raise money to "help Haiti." The smell of the popcorn drove me crazy, but the eager faces of those children lightened my heart. They were doing all they could for others, and they were doing a great job. I was very proud of them. I have read numerous articles about children raising money for the victims of the Haitian earthquake and every time they give me hope. One little seven-year-old Londoner rode his bike around and around his local park and raised 150,000 pounds for Unicef. Here he is doing his part to help. So many people have suffered as a result of the earthquake in Haiti, but the stories of the Haitian children are, to me, the most heartbreaking. I don't have much to offer them except my small donations of money, hand-made knitted hats, gloves and blankets, and my good wishes. I cannot send them books - which I would do - because they need food, water, medicines and other basic supplies right now. I hope to send books later when they are in a better situation to receive them. I can ask you to help these children, and that is what I am doing here. I know many of your have seen horrific images from Haiti and I know that it seems overwhelming. Just think of the children in your life, and in their names help the children of others. Perhaps the children in your family or community would like to do their part. Organizing a walk-a-thon, a run-a-thon, a bike-a-thon, or a read-a-thon won't take a lot of effort if lots of people give a little of their time. Children will feel empowered as they walk, run, bike or read to raise those precious cents, pence, and yen. Every February 2nd Punxsutawney Phil emerges from his burrow in Pennsylvania to see if he can see his shadow or not. If he does see his shadow, then we are all in for six more weeks of winter. If he doesn't see his shadow then spring will arrive early this year. The groundhog (Marmota monax), also known as a woodchuck or whistle-pig, or in some areas as a land-beaver, is a rodent of the family Sciuridae, belonging to the group of large ground squirrels known as marmots. Other marmots, such as the yellow-bellied and hoary marmots, live in rocky and mountainous areas, but the woodchuck is a lowland creature. It is widely distributed in North America and common in the northeastern and central United States. Groundhogs are found as far north as Alaska, with their habitat extending southeast to Alabama. And what about Groundhog Day. What is this all about. How did it all begin? Groundhog Day is an annual holiday celebrated on February 2. It is held in the United States and Canada. According to folklore, if a groundhog emerging from its burrow on this day fails to see its shadow, it will leave the burrow, signifying that winter will soon end. 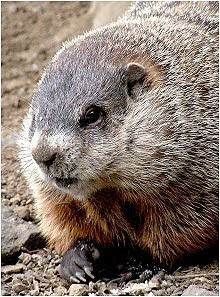 If on the other hand, the groundhog sees its shadow, the groundhog will supposedly retreat into its burrow, and winter will continue for six more weeks. The holiday, which began as a Pennsylvania German custom in southeastern and central Pennsylvania in the 18th and 19th centuries, has its origins in ancient European weather lore, wherein a badger or sacred bear is the prognosticator as opposed to a groundhog. The holiday also bears some similarities to the medieval Catholic holiday of Candlemas. It also bears similarities to the Pagan festival of Imbolc, the seasonal turning point of the Celtic calendar, which is celebrated on February 2 and also involves weather prognostication. Modern customs of the holiday involve celebrations where early morning festivals are held to watch the groundhog emerging from its burrow. In southeastern Pennsylvania, Groundhog Lodges (Grundsow Lodges) celebrate the holiday withfersommlinge, social events in which food is served, speeches are made, and one or more g'spiel (plays or skits) are performed for entertainment. The Pennsylvania German dialect is the only language spoken at the event, and those who speak English pay a penalty, usually in the form of a nickel, dime or quarter, per word spoken, put into a bowl in the center of the table. The largest Groundhog Day celebration is held in Punxsutawney, Pennsylvania, where crowds as high as 40,000 have gathered to celebrate the holiday since at least 1886. Other celebrations of note in Pennsylvania take place in Quarryvillein Lancaster County, the Anthracite Region of Schuylkill County, the Sinnamahoning Valley and Bucks County. Outside of Pennsylvania, notable celebrations occur in the Frederick and Hagerstown areas of Maryland, the Shenandoah Valley of Virginia, Woodstock, Illinois, and among the Amish populations of over twenty states and Canada. The University of Dallas in Irving,Texas has taken Groundhog Day as its official university holiday and organizes a large-scale celebration every year in honor of the Groundhog. Groundhog Day received worldwide attention as a result of the 1993 film of the same name, Groundhog Day, which was set in Punxsutawney (though filmed primarily in Woodstock, Illinois) and featured Punxsutawney Phil. I have reviewed several wonderful picture books for children about Groundhog day. You can read these reviews here.